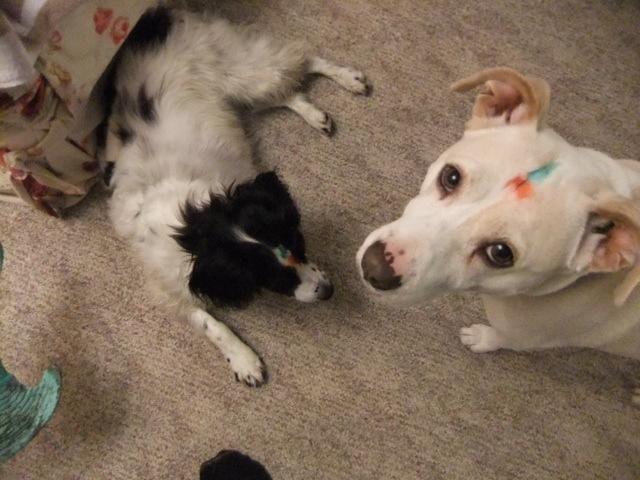 Loolie and Hershey are sporting green and red bindhi dots here. Scott applied them with his watercolor paint. Only Scott would think of something like that! Can you understand what a powerful attraction this man is for me? Creativity oozes from his pores and inspires my own. This picture was taken Christmas 2009. That holiday season Scott was recovering from two earlier intestinal surgeries and was taking capecetibine tablets ( aka chemo) but that did not stop us from going on a road trip with our babies to a seaside cottage in Wilmington, NC. Anything to take his mind off of the situation…and create positive, fun memories to fill up the love bank with. That has always been Scott’s agenda no matter the occasion. Pasquale, owner of the largest leather company in the world, Natuzzi, called Scott his happiness supplier. Scott’s been my personal happiness supplier for 7 1/2 years but it is only now that I am fully conscious of the hundreds of others out there that have counted on him for fun and smiles for decades. This year our pupkies will spend the holidays in Maine with our remarkably generous–and talented– artist friend Maureen while we are in Goa. We wish all of our loved ones a very happy holiday season. Hold each other close and don’t be afraid to overuse those three little words…i love you!. We love you! This entry was posted in Uncategorized and tagged bindhi dots, christmas, dealing with cancer, dogs, Going to Goa Blog, holiday dogs, india, Katy Allgeyer, maine, mozelle studio, natuzzi, Scott Morgan. Bookmark the permalink. Swwweeeeet!!!! The pupkies are sleeping… And all is well here. We love you too!